Combined layers for extreme breathability and abrasion resistance. 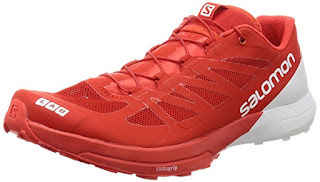 Designed with the trail racer in mind, the Salomon S-Lab Sense 6 Sneakers offer a lightweight and low to the ground feel for maximum performance. Updates on the upper will offer a more precise foothold as well as increased breathability to keep your feet comfortable on the most technical terrain. A redesigned lug pattern with premium wet traction Contagrip provides sticky traction so you can run fast on any trail. For top of the line performance on a variety of surfaces, the S-Lab Sense 6 continue to be a stand out trail racing shoes. Salomon unisex footwear is sold in men's sizes. Material: Mesh, Manmade, Rubber.